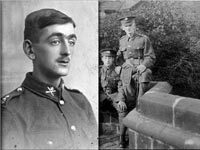 This is the story, as much	as	I	have been able to piece together, of my great uncle Edward Garside Whitehead, my grandmother's younger brother, who died on the first day of the Battle of 3rd Ypres (Passchendaele), 31st July 1917. He was 21 years old. Edward's Oldham roots go back to 1792, when his 2xGt-Grandparents (and my 4x), John & Sarah Steeple (née Fernihough), came to Oldham from Derbyshire. EDWARD3 GARSIDE. and I are descended through JOHN2 and SARAH Steeple's 11th child, AMELIA1, born in 1806, who married WILLIAM1 Whitehead (son of EDWARD1 and MARTHA1 Hadfield) in 1825. The Steeples were farming families in the Wirksworth area but JOHN2. who made the move to Oldham, became variously a butcher and/or farmer (ref. children's baptism records and his own death certificate.) as did several of his sons and grandchildren. One of his sons, Stephen, returned to Derbyshire and farming and at least one daughter married a Derbyshire farmer. The large Steeple family in Oldham (14 children ... only the 14th, a daughter, dying in infancy) tended to return to family trades, marry into these occupations, or have licensed premises. The Gartside family originated in Saddleworth and goes back with certainty to JOHN3 Gartside born in 1756 whom I believe to be the son of JONATHAN Gartside and his wife SARAH. The Whitehead family can be traced back to JAMES (b. c1754) a bricklayer in Failsworth, and his wife, SARAH. They had 12 children (6 sons and 6 daughters) that I've identified between 1773 and 1795. EDWARD1, was their 4th child, and also their 4th son, born in 1779. EDWARD1 Whitehead, (a Failsworth born bricklayer) married MARTHA1 Hadfield in 1797 and by this time he was living in Fairfield, Droylsden. They would have 10 children (7 sons and 3 daughters). Their son WILLIAM1, their 5th child, was born in 1804. Whether he would intend, in his early years, to follow in his father's and grandfather's footsteps as a bricklayer, I have no way of knowing, although I think it possible. However, WILLIAM1 married AMELIA1 Steeple in 1825 and a year later, on their son's baptism record, he is already shown as a butcher. It's highly probable that this is owing to AMELIA's strong family connections to farming and butchery. In 1841, on the census return, WILLIAM1 and AMELIA1 have a son, EDWARD2 (born in 1826), and are living on Maygate Lane, Oldham, where WILLIAM1 is recorded as a butcher. By 1851, WILLIAM1 and AMELIA1 are living with WILLIAM's1 retired and widowed father (EDWARD1) in Droylsden, on Market Street. EDWARD1 is recorded as having been born in Failsworth (in 1779). WILLIAM1 is still a butcher. EDWARD2 (born in 1826) appears to have been the only child of WILLIAM1 and AMELIA1 (I've found no evidence of other baptisms or births for them). On the1851 census EDWARD2 is himself a married man and is living only a few doors away, from his parents, on Market Street, with his wife MARY (nee Haughton) and infant daughter Amelia2. EDWARD2 is shown as a 'beer seller' They go on to have another son, William2 in 1855 and a daughter, Martha Ann, in 1858. In 1864, EDWARD2 and MARY have another son, JAMES EDWARD. He would become my 2xgt.-grandfather and EDWARD3 Garside Whitehead's own father. Back to EDWARD2 and MARY Haughton ... EDWARD2 had changed occupations by each subsequent census. In 1861 he was a butcher living on New Street and in 1871 a 'commercial traveller' living on North Street, but always in Droylsden. Their younger daughter, Amelia2, died in 1868, at the age of 19 and their elder son, William2, died in 1878, age 23. EDWARD2 himself died in 1872, a year after his own father, age 46. His younger son, JAMES EDWARD was a child of only 7 years at the time. By the 1881 census, JAMES EDWARD, with his sister Martha Ann and widowed mother MARY are back living on Market Street, with his also widowed grandmother, AMELIA1 (WILLIAM1 had died in 1871). Martha Ann, JAMES EDWARD's sister, seems to be the only wage earner in the household and is a 'tailor's machinist'. In 1891, JAMES EDWARD is now a married man living just across the road, from his old home, at 53 Market Street and is following in the family tradition as a butcher. Married in 1884 he and his wife MARTHA2 (nee Garside) already have 5 of their eventual 10 children. My grandmother, FLORENCE, would be born the following year in 1892 and her brother, EDWARD3 GARSIDE, would be born in 1896. MARTHA3 Garside (born 1864) was the 9th of the 10 children of JOHN4 Garside (born 1821) and his wife MARTHA2 (nee Blake[ck]ley). He had left his home and family, in Oldham, just before the 1841 census. His father BEN (born 1789), mother, BETTY nee Scholfield, (born 1792) and his siblings had moved from Bleakhey, Saddleworth, to Oldham around 1830 (referenced by the baptism records of later children). On the 1841 census JOHN4 was living on Booth Street in Salford, eventually moving to Openshaw, next to Droylsden, where MARTHA3 met and married JAMES EDWARD. 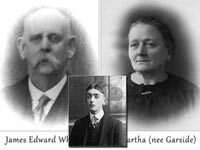 Back to JAMES EDWARD and MARTHA3 ... in 1901, the Whitehead family, now with 8 children are living at Edge Lane Farm, Droylsden, where JAMES EDWARD is still following in a family trade and is recorded as a 'farmer'; his eldest son, Samuel age 14 is shown as 'farmer's son'. EDWARD3 GARSIDE is a 4 year old infant. Although living in Clayton, the Whitehead family still had very strong Oldham connections ... on his mother's side EDWARD GARSIDE. 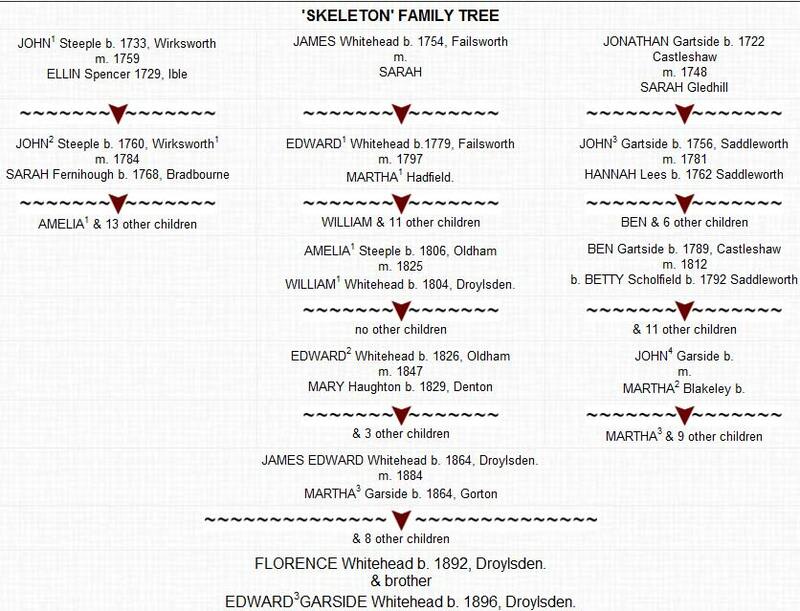 was descended from Garsides who lived in Bleakhey, Delph and on his father's side, from the Steeple family who came to Oldham from Derbyshire in 1792 and also from the Whiteheads who originally came from Failsworth. 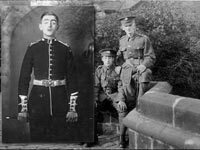 He still had relatives on both sides of his family living in the Oldham area ... but how close, or well known to him, they were, I have no way of knowing. * formation of the 4th Battn. * Guards Division in 1915. * The 4th Battn at Loos. Edward lands in France Oct.
* Diary of War - Aug -Sept.
* 1st Battn. Aug - Sept.
* Diary of War - Oct - Dec.
Pub. 1920 in 3 Volumes, is freely downloadable as .pdf files or can be read on-line.